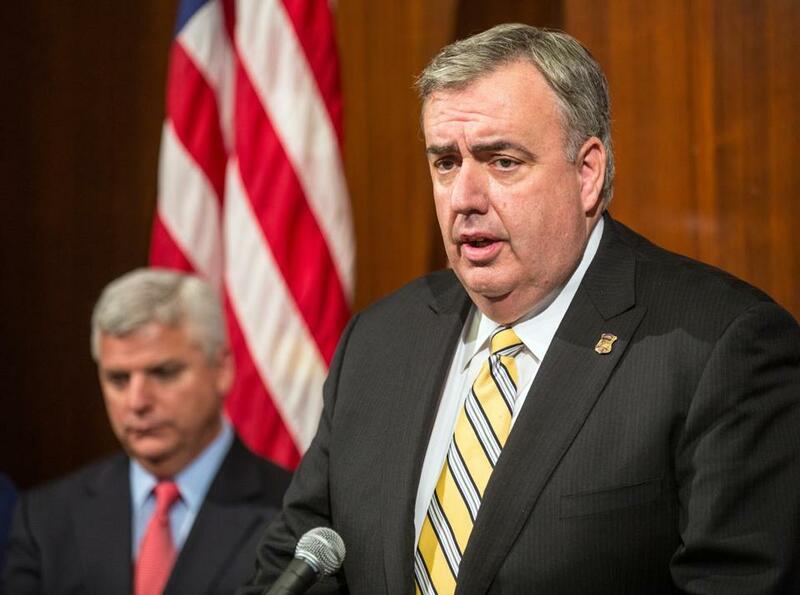 Edward Davis shared details of the police response to the Marathon bombing. Boston Police Commissioner Edward F. Davis participated in talks with high-level Palestinian and Israeli police officials in the West Bank this week, part of an 18-month effort to increase cooperation between local police agencies in the region. Davis presented an overview of the police response to the Boston Marathon bombings, noting that cooperation between local, state, and federal law enforcement agencies led to the arrest of suspect Dzhokhar Tsarnaev. “They were very interested in how the investigation unfolded, because we made an arrest so quickly,” Davis said in a phone interview from Jerusalem. At a press conference Wednesday, Yohanan Danino, Israel’s national police chief, and Major General Hazem Atallah, chief of the Palestinian Civil Police, pledged to work together on regional issues such as reducing traffic fatalities, preventing family violence, and stemming the drug trade on their shared border. The Israeli and Palestinian agencies formed a working group to plan joint initiatives, Davis said. Davis’s visit is the latest by a US law enforcement official as part of the 18-month effort to bridge the gap between the agencies in the Middle East. The meetings were spearheaded by Jordanian officials and the Police Executive Research Forum, a Washington, D.C., think tank that advises law enforcement agencies around the world. Since the talks began a year and a half ago, New York City Police Commissioner Raymond Kelly, Las Vegas Sheriff Douglas Gillespie, and Davis have met with their Israeli and Palestinian counterparts , said Chuck Wexler, executive director of the research forum. While the two agencies have increased cooperation in the past few years, Wexler said there has been little or no communication between the highest-ranking officials in the agencies. The general public tends to think there is an ongoing open conflict in the West Bank, said Peter Krause, an assistant professor of political science at Boston College who specializes in the region. In reality, lethal attacks have dropped in recent months, and the governments have increased cooperation on administrative matters, such as taxation. Davis said the talks would prove vital to the two law enforcement agencies. Sharing information and working together on regional investigations are crucial to policing, he said. “It is amazing how similar the job of the police officer is, no matter where you are,” he said. Javier Panzar can be reached at javier.panzar@globe.com. Follow him on Twitter @jpanzar.